The latest version of the ROMS/TOMS svn repository, revision 550, was frozen and tagged as ROMS 3.4. This version is quite stable and includes several improvements to all 4D-Var and (4D-Var)T data assimilation algorithms. The major developments and improvements are summarized below. Additional detailed information can be found in the ROMS repository trac ticket system. Please check the upgrade type tickets. Many thanks to Andy Moore for his great help in the development and testing of all 4D-Var and (4D-Var)T data assimilation algorithms. Notice that it is much easier to comment options in the build script that using the define/undef directive in the header file. We provided a lot of documentation about how to use these algorithms in WikiROMS with several 4D-Var tutorials. The tutorials are part of the ROMS data assimilation workshop that Andy Moore and I offered in July 2010 at the University of California, Santa Cruz. The forcing data is from a typical year (days 0.5 to 364.5) ECMWF 40-year re-analysis. The time coordinate has the cycle_length attribute with a 365 value. Therefore, this application can be run for several years with a perpetual annual forcing cycle. Notice the new local variable which_MPI to specify which MPI library to use during compilation. You need choose only one and comment the other values. The value of local variable USE_MY_LIBS is commented out by default. If you want to use this nice capability, you need to change the paths of the required libraries in your particular computer. Recall that you may want to have different copies of the build script for a particular computer. Again, all the above logic is processed when the environmental variable USE_MY_LIBS is not empty and has any non-blank value. This change required an update to all the make configuration (*.mk) files in the Compilers directory. This cleaned the logic nicely. Notice that nc-config is not available for NetCDF 3.x. Many thanks to Mark Hadfield for suggesting this change. The time-averaged, diagnostic terms for the momentum (DIAGNOSTICS_UV) and tracer (DIAGNOSTICS_TS) equations were expanded to include components in the ξ- and η-directions for horizontal advection and horizontal viscosity/diffusion. For technical information on implementation check following trac ticket.
! fields into AVERAGE output file.
! tracers other than biological and sediment tracers into the AVERAGE file. Since we control the time-averaged fields with switches, there is no longer a need for the following C-preprocessing options: AVERAGES_AKV, AVERAGES_AKS, AVERAGES_BEDLOAD, AVERAGES_FLUXES, AVERAGES_NEARSHORE, AVERAGES_QUADRATIC. These options are eliminated. The only option that is required to write any of these fields is AVERAGES. This is nice because we do not have to recompile if new fields are needed later. The routine set_avg_tile was completely redesigned to use these control swithes. Notice that arrays are no longer passed as arguments. This facilitates adding new fields in the future. We still need the option AVERAGES_DETIDE to process time-averaged, detided fields. Notice that we also control the processing of these fields with the Aout switches. Also, I added the capability to detide temperature and salinity since we have better control of the memory requirements.
! 2D momentum (ubar,vbar) diagnostic terms into DIAGNOSTIC output file.
! 3D momentum (u,v) diagnostic terms into DIAGNOSTIC output file.
! terms into DIAGNOSTIC output file: [1:NAT+NPT,Ngrids].
! into AVERAGE output file: [1:NBT,Ngrids].
! biological processes diagnostics terms into DIAGNOSTIC output file [Ngrids]. A new C-preprocessing option FLOAT_STICKY was added to reflect floats that hit the surface and stick floats that hit the bottom. This is needed to avoid overshoots and spurious unmixing near the boundary when vertical random walk (FLOAT_VWALK) is activated. Many thanks to Mark Hadfield for contributing this option. Due to its functionality and properties Vtransform = 2 and Vstretching = 4 are now the default values for ROMS. Many thanks to Sasha Shchepetkin for designing this nice and continuous transformation. A new parameter, Nvct, was added to the s4dvar.in input script. 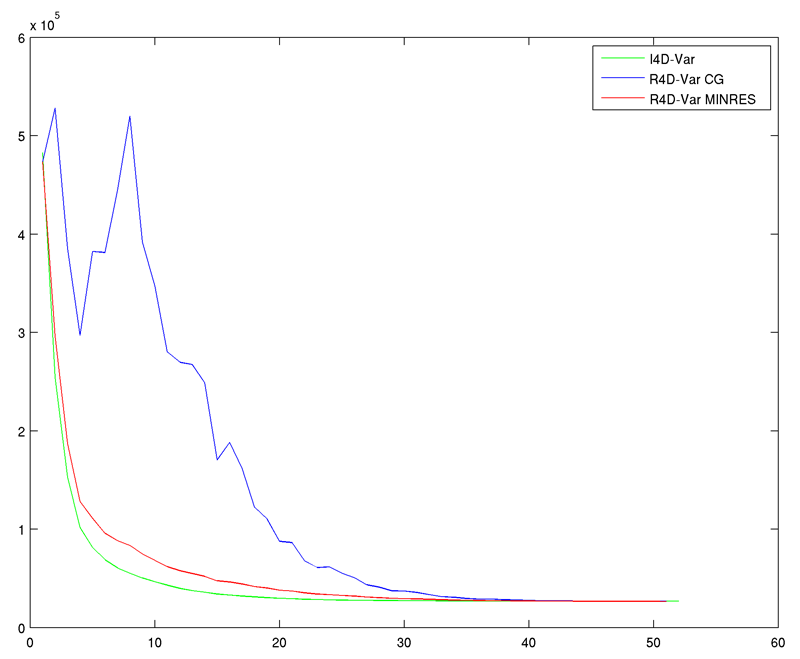 If ARRAY_MODES is activated, Nvct eigenvectors of the stabilized representer matrix will be processed (Nvct=1 is the least important, and Nvct=Ninner is the most important). If CLIPPING is activated, only eigenvector Nvct=Ninner will be processed and the rest will be disgarded. This algorithm also works for the associated observation sensitivity and observation impact. We still need to work on the posterior analysis routines posterior.F and posterior_var.F. These routines will be updated to MINRES later. Many thanks to Andy Moore for his help in coding and testing this new algorithm. Also many thanks to Amal El Akkraoui for bringing this minimization algorithm to our attention at the last International Adjoint Workshop. The check-pointing CPP option, CHECKPOINTING, is no longer an internal flag. It is removed from globaldefs.h and the User needs to activate it explicitly in order to create/use the GST restart NetCDF file. Recall the the restart switch LrstGST is activated in the standard input ocean.in file. I removed all the calls to the BLAS library routines daxpy and dnrm2, which is used to computed the Eucledean norm in the GST algorithms. The BLAS library only works in parallel with the PGI compiler. We were getting the wrong norms with the ifort and gfortran compilers. This is due to the legacy code style in this library that dimensions arrays as x(1) instead of x(n). The MPI reduction operations were giving incorrect values. In addition, these routines and others have deprecated arithmetic GO TO and were getting a lot of warnings during compilation. Some of these legacy libraries need to be updated for future compilers that do not support old f77 dimension style. To avoid problems in the future, I wrote my own Eucledean norm routines for real vectors (r_norm2) and complex vectors (c_norm2).
! GST output and check pointing restart parameters. The eigenvectors for the AFT_EIGENMODES or FT_EIGENMODES are usually complex. In this case, both the real and imaginary eigenvectors are stored in the same file when LmultiGST is activated. Notice that all the eigenvectors have an output record for the initial or final perturbation, except the eigenvectors that have only the adjoint model as a propagator (AFT_EIGENMODES and SO_SEMI). This is a function of the running time window. The subroutine mp_ncwrite in distributed.F, which used to write 1D/2D state arrays in the GST algorithms, is split into mp_ncwrite1d and mp_ncwrite2d.
! which Forcing Singular Vectors or Stochastic Optimals is required. Notice that only one of these variables is needed according to the C-preprocessing option UV_LOGDRAG, UV_LDRAG, or UV_QDRAG, respectively. 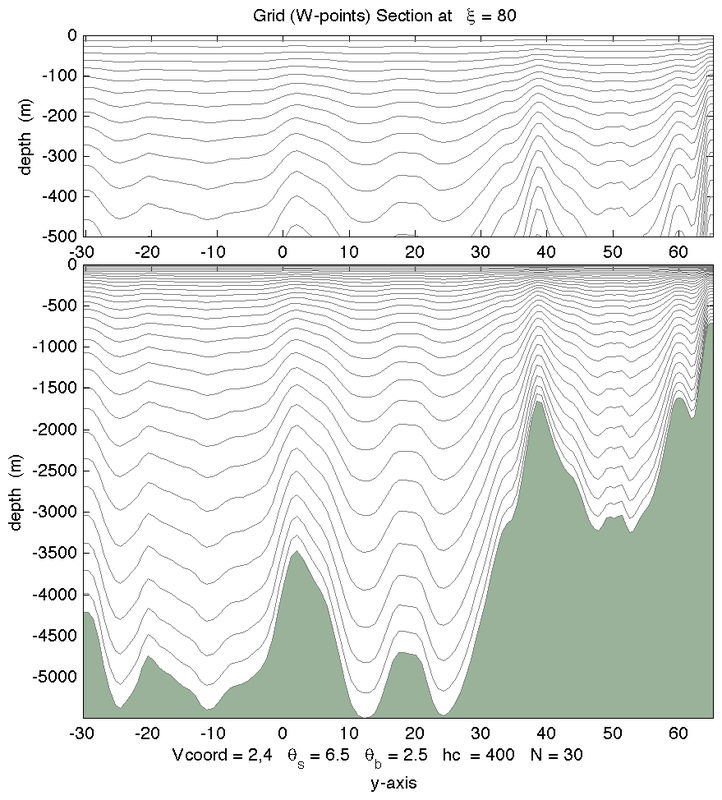 It is also possible to use spatially varying ZoBot when SEDIMENT and/or internal BBL_MODEL options are/is activated. The user is allowed to have different NetCDF variable names for these bottom friction parameters. This can be done in the metadata file varinfo.dat. Any of these time-independent variables are written to the header of output NetCDF files when UV_DRAG_GRID is activated. Notice that the sediment variable bottom(i,j,izdef) is initialized to ZoBot. However, bottom(i,j,izdef) changes in time due to sediment processes. There is a difference in these variables due to the time dependency which affect the adjoint model. Notice that this information is written after the global energy and volume diagnostics. The total value of C is not written in 3D applications, but it can be obtained by summing the values of Cu, Cv, and Cw. This information also gives you the clue of which component of C is getting is the largest. In some applications with rotated tensors the value of Cw may get large and the time-step needs to be reduced to avoid the model to blow-up.